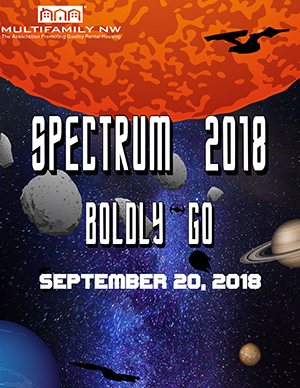 Spectrum is here! This is your one-stop shop for all of your day of needs. Handout Information: Multifamily NW will provide handouts for the presentations (as supplied by the speakers) via our website www.multifamilynw.org. Everyone will be responsible for printing and bringing handout materials on-site if so desired. Don’t forget a Notepad & Pen! Continuing Education (CE) Credits: Attendees who attend the entire conference are eligible for up to four (4) continuing education (CE) hours. Certificates of participation will be available for individual’s own record keeping. Multifamily NW does not submit hours on behalf of the individual attendee. Attendees should only claim credit commensurate with their level of participation in the conference. Link for the Education Passport is below. Scavenger Hunt: We are bringing back out annual scavenger hunt with a chance to win $250! If you would like to participate you can register at registration. Two people to a team. Keynote Speaker: We are welcoming Lt. Col. (Ret.) Rob “Waldo” Waldman as our 2018 Keynote Speaker "Never Fly Solo"
Motivational keynote speaker Waldo Waldman – The Wingman – is the author of the New York Times and Wall Street Journal Bestseller “Never Fly Solo”. He teaches tactics on how to build trusting, revenue producing relationships with employees, partners, and customers while sharing his experiences as a decorated fighter pilot and sales expert. A graduate of the Air Force Academy, he holds an MBA with a focus on Organizational Behavior and is a former top producing sales manager. He successfully led national sales efforts for several cutting edge technology and consulting firms before becoming a motivational speaker and leadership expert. Each attendee will receive a free downloadable copy of his New York Times bestseller Never Fly Solo. The Oregon Convention Center has another event the same day as Spectrum with expected attendance of several thousand with their first session beginning at 9:30 a.m. If possible use alternative transportation such as MAX (Navigate to the OCC using TriMet's trip planner), the bus or the streetcar all of which have stops at the Oregon Convention Center. Attendees who arrive after 9:30 am may not be able to park the convention center's parking lot. Click HERE for a map of alternative parking near the Orgon Convention Center. *Parking fees are not included in your conference registration.